The CX-4 is a Quad Transport Stream Converter. 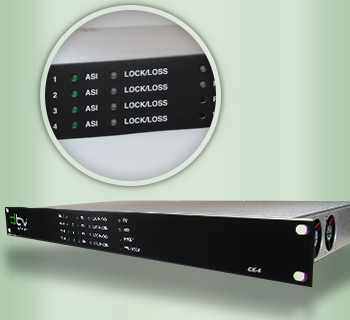 The CX-4 converts IP to ASI or ASI to IP independently. It complies with both DVB standard and SMPTE2022. The IP interface supports Transport stream encapsulation, forward error correction and UDP/RTP de-encapsulation as defined by the SMPTE 2022 specification. Adhering to our products philosophy, CX-4 is designed for easy operation. It is controlled via a web server user interface and it is field upgradable. It comes with dual power supplies for reliability.